After spending time with the Carrowmore stone circles I wanted to visit the Faery Glen. It wasn’t far away but I had only been there once before and knew that you could drive by it all day and never find the well hidden entrance. So I wandered into the Carrowmore visitor center to ask directions. The guide on duty was at first shocked by my question, I expect because the Glen is known only to locals, not signed and on no map. He quickly recovered from his surprise and said, “Oh, now, you can’t be going there and I can’t be giving you directions.” And that was the end of our conversation. 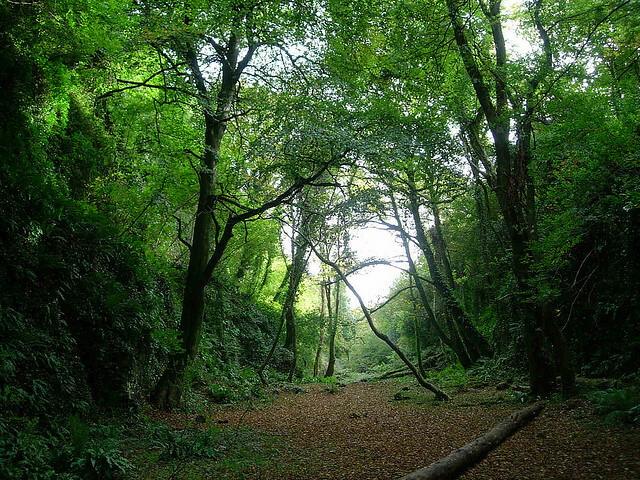 It was only after several years of traveling to Ireland and spending time with the same people that I was told about the Faery Glen, and then I was only told about it. “Now, have you been to the Faery Glen?”, would be the question and when I indicated that I had not the response was “Ah, well now that’s a most interesting place.” But no directions were offered. It would be a few more years before I was taken to the Glen. While Ireland is a Catholic country, other world alliances, relationships and places are very present for the people, the mystical mysteries closely guarded.